This all-in-one-set includes:BBQ Spatula / Turner , Salt and Pepper Shakers ,Bbq Tongs,BBQ Fork ,8 Corn holders,bbq skewers, Cleaning Brush,Basting Oil Brush,4 Skewers ,6 Knives,6 Forks, Chief knife in Aluminum Storage Carrying.Our professional grade stainless steel BBQ Set With Aluminum Case in stay in good condition over repeated use without rusting or breaking. Hang them on hanging loops on the handle.ith a carving knife, basting brush and meat tenderizers to go with the essentials, you'll grill like a pro! The handles are long to keep you safe and away from the heat. Looking for ideal 24pcs Stainless Steel BBQ Tools Manufacturer & supplier ? We have a wide selection at great prices to help you get creative. 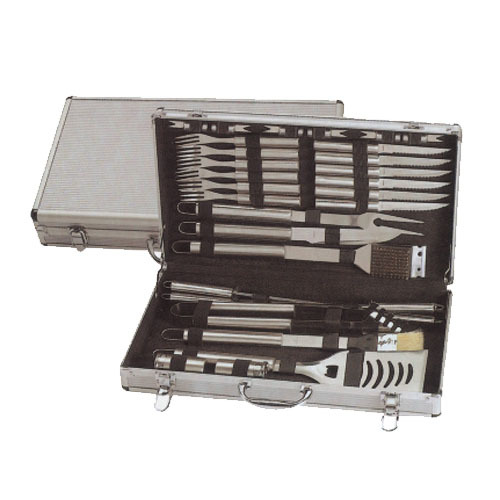 All the Aluminum Box Bbq Tools Set are quality guaranteed. We are China Origin Factory of 24pcs BBQ Tools Set. If you have any question, please feel free to contact us.